Welcome to the Creative Inspirations Paint Blog Hop! You should have arrived here from Shelley's blog, if you missed it then just go back to the beginning at the Creative Inspirations Blog. We're celebrating the one year anniversary of Creative Inspirations!! 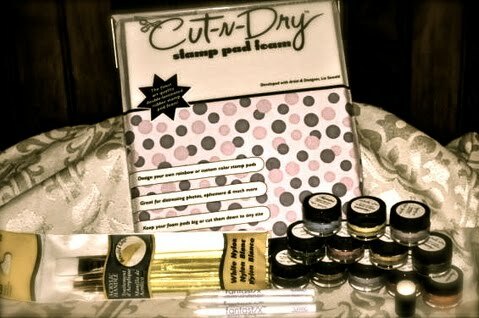 Above is the wonderful prize up for grabs at the Creative Inspirations Blog. All you have to do to be in with a chance of winning this great prize is gather all the letter clues from each of the design team's blog (they'll be big or in a different color), go back to the Creative Inspirations Blog and leave your answer in the comment box!! Easy!! You have until Midnight Wednesday 18th August to enter. What goes well with Beige? Why lemon of course!! I was inspired by a recent Waltzingmouse Sketch for this card. Lots of lovely layers and textures. I stamped the border at the bottom of the card in Beige, it's from Victorian Fripperie by Waltzingmouse Stamps. Here we have a pretty mix of crochet flowers, buttons, pearls, satin ribbon, twine, some eyelet lace and some quilled flowers I made. I just love all the different textures! I decided to make a pretty tag for this color. I love teaming White with Denim, nice and crisp. Here I stamped the flower border from Great Impressions in VersaMagic and embossed in Silver Pearl, I used the resist technique and sponged over the Denim paint, then rubbed over the stamped area with a paper towel. I used a little blending chalk to soften the edges. The pretty white flower is from Imaginisce's Cottage Christmas Range - Snow Flowers. I added the button to the centre. A detail from the border, I love with the darker Creative Inspirations colors you get beautiful silver flecks when you paint with it. This one really is a perfect Denim color!! Moving on to the final two colors, Ivory and Burgundy, I combined the two in this card because they go so well together! The pretty patterned paper is from the Thrift Shop (October Afternoon). I really like this yummy Ivory teamed up with pinks and Burgundy, they really work well together. I love the deep rose velvet ribbon, so soft! This gorgeous little dusky rose crochet heart is from Annie Design at Etsy. I painted some cream silk ribbon with the Burgundy paint, made a little bow and stitched it to the heart. You always get amazing sparkle when you paint on ribbon with Creative Inspirations Paint! I distressed the border by sponging some of the Ivory paint around the edges, I love the way it catches the light. I stamped the simple sentiment (Sweethearts from Waltzingmouse Stamps) using the Burgundy paint! I added some pretty crochet lace from the Stamp Simply Store. Now continuing with the Blog Hop, it's time to visit Kendra's blog and see what she's created! Don't forget to look out for the next letter clue to be in with a chance of winning the fabulous prize!! Enjoy the rest of the Blog Hop!! I love the card with al the diferend flowers! Wow, you showed off the colors so well. Love your work. It's beautiful. WOW! Your cards and tag is just fabulous. I love all of your gorgeous cards- what a fabulous showcase! Beautiful cards and tag! Love how you made a card to show off each color, what a great idea! You've outdone yourself. gorgeous creations. Those paints are fabulous. All of your are gorgeous. Love how you used each color individually! Fab creations, love your attention to detail! Love the soft elegance of your artwork! ALL are just fabulous........So pretty. You just do wonderful work. wow - thanks for all the great art! Gorgeous cards and so feminine. Love all of them! I love your demin tag. Wow what a show of wonderful card designs! I love the first one the best with all the lemon color buttons. Lovely creations, ALL of them, my fav tho is the first, very pretty! Gorgeous cards -- love the button flowers! The white and denim is so pretty also! Love those subtle colors ... so elegant ... and the buttons and flowers are super-fab. OH CLARE! Your work is sooooo beautiful! I hope you submit it for publication, it's amazing! wonderful job on the cards and tag! i love the crochet heart! beautiful projects, Clare! love the row of pretty elements on your first card! You did a wonderful job with your cards they are beautiful! I love all of the new colors...and now the Buttercup color as well. I really like your tag with the new "denim" color! Just fabulous! Thanks for showing that you can use these paints on fabric also!